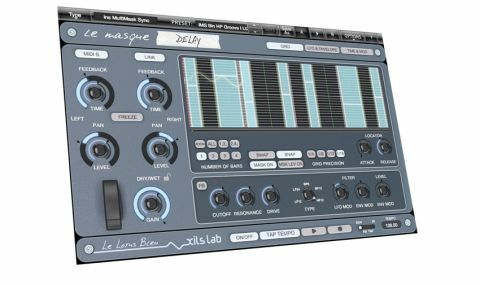 Le Masque: Delay 1.5's masking system takes the ubiquitous filter/ delay combo to new heights. Mask concept is ace. Filter sounds beautiful. True stereo delay. Glitchy. Poor manual. LFO and envelope could be better utilised. At its core, Le Masque is a true stereo delay with a resonant filter, host-syncable LFO and an ADSR envelope onboard for modulation. There's a mod wheel, too. An unusual control to see on a delay plug-in, here it's used as a MIDI control source via the concise onboard MIDI CC assignment/learn system. The global gain and Dry/Wet mix knob features a new Lock button that fixes the mix level when engaged, enabling preset switching without changing the dry/wet balance. However, the Lock icon opens when engaged and closes when disengaged. A bug? The bottom right of the interface hosts the resonant filter. This offers high- (12dB), low-(12dB, 24dB) and band-pass (6dB, 12dB) modes, and can be placed before the delay or inserted into its feedback circuit. "A mask is a zone on the timeline during which the wet filtered delay signal can be heard"
The main window is where the fun starts, for here is where your 'masks' are defined. With a maximum capacity of 16, this is a significant increase from the previous limit of eight. In simplistic terms, a mask is a zone on the timeline during which the wet filtered delay signal can be heard. To illustrate this, if the whole window is filled with one mask the result is a conventional delay. When cutting that mask in half, however, and leaving one half of the window mask free, the delay signal will only make it to output during the masked half. The incoming audio signal is traced in the background of the display for reference, which is another new 1.5 feature. The 'masking area' is extendable from one to four bars long and the snap grid (for moving and re-sizing masks) can be set to 1⁄4, 1/8, 1/12 or 1/16, or turned off altogether. Multiple masks can be selected at once for moving and re-sizing together, while the new Zoom function is good for making precise adjustments. The idea, then, is to combine masking with filter modulation to create lively rhythmic delay patterns, enhancing drum and percussion loops, and animating non-rhythmic material. Throw in a few MIDI controller assignments for hands-on tweaking and you have a hugely creative effect that offers something genuinely different to anything else on the market. It sounds superb, too, thanks to XILS' exceptional talent for filter design. On the negative side, it suffers from the odd glitch (not always forgetting deleted masks being the worst offender). The manual is pretty ropey (it doesn't seem up to date with v.1 let alone v.1.5), and the LFO and envelope could have been better exploited to enable modulation of more than just the filter cutoff and level. Why not do the same with the Time control, at least? All considered, if you can live with those issues Le Masque: Delay will win you over with its groovy rhythms, unique style and warm, up-front sound.